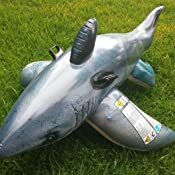 Amazon's Choice for "shark pool toys"
Approximate deflated size: 68" X 42"
Approximate inflated dimensions: 68" X 42"
The coolest shark ever, this Intex Great White Shark Ride-On will be the hit of every pool party with its realistic design! 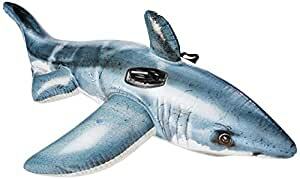 1.0 out of 5 starsNow no one will ever believe it's a real shark!! 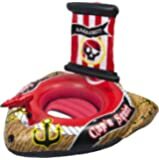 2.0 out of 5 starsIt's a slide, not a float. 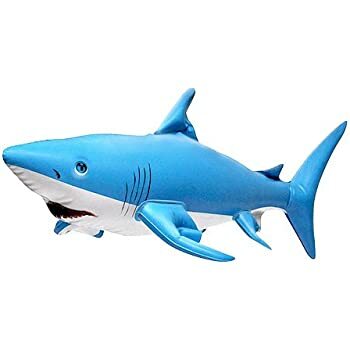 I'm amazed this shark gets such good reviews. It makes me wonder if some of the reviewers have actually used it yet. First of all, the warning labels are in fact obnoxious and it is quite deceiving that the picture does not show the actual product. 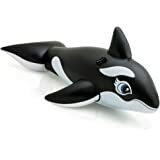 But the main problem is that it is nearly impossible to sit on this shark without sliding right off the tail. The kids still have some fun trying to stay on, they made a game out if it. I doubt that fun will last long. 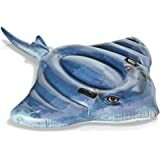 We also have the manta ray. It's huge, but awesome. 2.0 out of 5 starsWhy in the world such a HUGE warning label! I should have read and looked at other customer complaints about the permanent HUGE warning label on the TOP of the left fin. 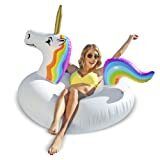 I would have never bought it even though it is a cool looking float based on the one sided picture. Consider this a scam and steer clear until they clearly show both sides in the selling picture and then make your choice. item received is not even close to what is pictured or described. and to return I have to pay for shipping when it is their mistake. The picture shows what I received and as you can see it is quite different then what they have listed. BUYER BEWARE. 5.0 out of 5 starsGRANDKIDS LOVED THEM! 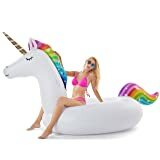 ~ UNBELIEVABLE PRICE! 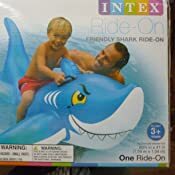 Bought the Intex Great White shark and the Intex Stingray for my grandchildren (boys 6 & 7) and they absolutely loved them. 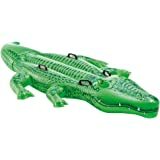 They are very heavy vinyl, well made, and actually realistic looking except for the tacky safety warnings printed on the top sides of the floats. The body of the shark sits a little above the water and floats on its side fins. The ray is large enough for two small children. They took a beating and are still holding air. Very pleased. Super price for the quality. 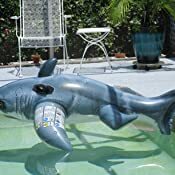 5.0 out of 5 starsGreat shark makes pool time fun! 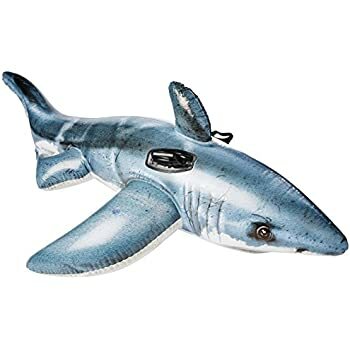 This is a great shark for a pool season. 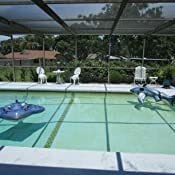 We bought one last season, and it held up for a few months until too many kids jumped on it from the diving board onto the shark and the seam popped. We liked it enough to buy it again. 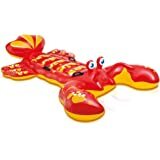 It won't last forever as we are very rough on our pool toys but it was Fun and reasonably priced so we ordered another one. 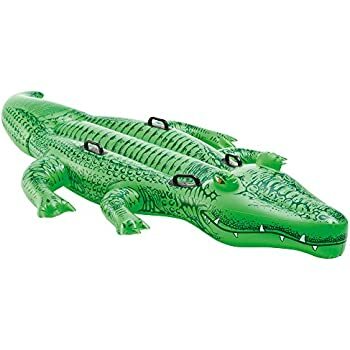 Very good printing on the inflatable, looks a little realistic from the pool view and made my little baby nervous at first. 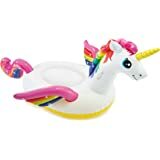 All the little boys who swim in our pool absolutely love this float and fight over who gets to try to ride it next. It is a little tippy, but that is part of the fun. 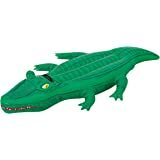 My nephews had so much fun with this inflatable. 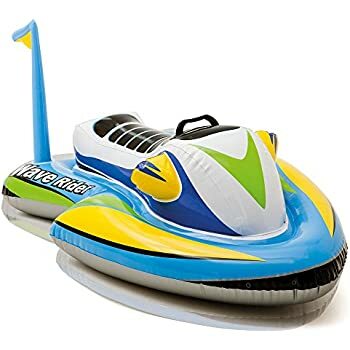 It is big; about 6 feet long, made of durable plastic, has two handles on the sides on each side of the dorsal fin that are well secured, it looks very cool, and offers a variety of ways to play with it in the water. 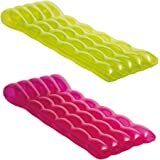 I did not have an inflater and I highly recommend using one. I inflated it manually, but it takes a while and requires the respiratory output of an Olympian! 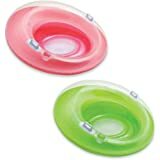 I highly recommend that kids be supervised closely when using this product because they can get their feet inside the handles. I cut the handles to help prevent them getting their feet or arms caught. 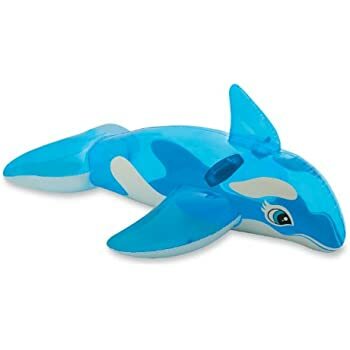 Bought this for shark week lol he chilled on the sofa with me all week. The dogs where frightened by the lifelike details and would not come near it. 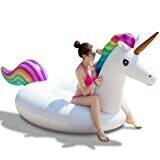 We took it to an adult pool party and everyone had a blast jumping on it and trying to ride it. Nearly impossible for an adult.. however it held together well for 150 - 200+ pound adults jumping on it. I believe the weight limit is 80lbs.